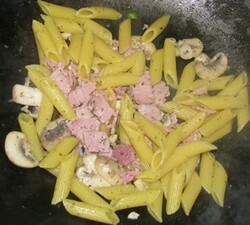 Sometimes there just isn’t time to cook a proper meal, and while the ready meals at the supermarket are often a tempting option, this simple dish with bacon, mushrooms and pasta is easy to make, quick to cook and very tasty. All you need is a saucepan and a wok or frying pan, and you are ready to go. This pasta dish is very quick and simple to cook but is flavoursome and refreshing. This makes it an ideal meal to whip up when short of time. It can be eaten with just a fork, so put it in a large bowl and balance it on your knee while watching television. The amounts shown are enough for one person, so multiply up the main ingredients depending on the number of people being cooked for. Adjust the garlic, chilli and parsley according to taste if cooking for more than one. The amount of time the penne needs to be boiled varies depending on the brand, so check on the packaging. Normally there is a range of cooking times with the shorter time producing a firmer al dente style. Smoked bacon can be used instead of unsmoked but this tends to have a stronger flavour and could overwhelm the dish. The chilli is optional, but if not used then half a teaspoon of ground black pepper should be added instead. More chilli can be used if a hotter dish is preferred. Only a small amount of olive oil is needed, just enough to cover the bottom of the pan. Devices for fine spraying oil onto the pan exist and are suitable for this dish as the bacon will create its own oil as it starts to cook. Serve with a crisp and sharp white wine or a light hoppy or citrusy summer beer. Some tips about what to do with leftover turkey after Christmas or Thanksgiving.